Clemson University requires all students to take a speech class before they graduate, and as an architect student, my speech component was built into my regular architecture curriculum over three semesters. The spring semester of my freshman year (my first speech class), we were required to give a speech on a famous architect. Wanting to do an architect who interested me, I did a bit of research and discovered Peter Dominick, the architect behind Disney's Wilderness Lodge and Disney's Animal Kingdom Lodge at Walt Disney World and Disney's Grand Californian Resort at Disneyland Resort. 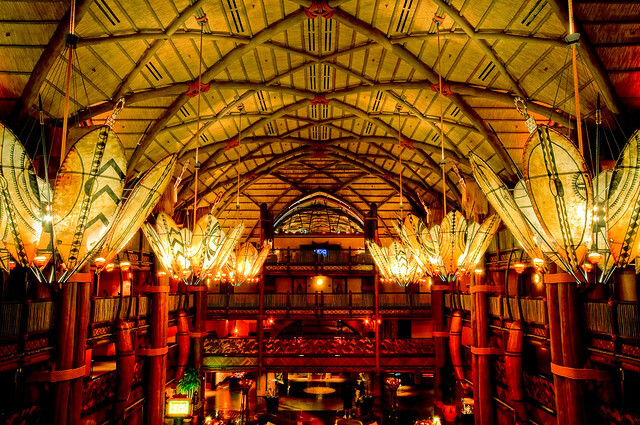 This is part one of two, discussing Disney's Animal Kingdom Lodge. 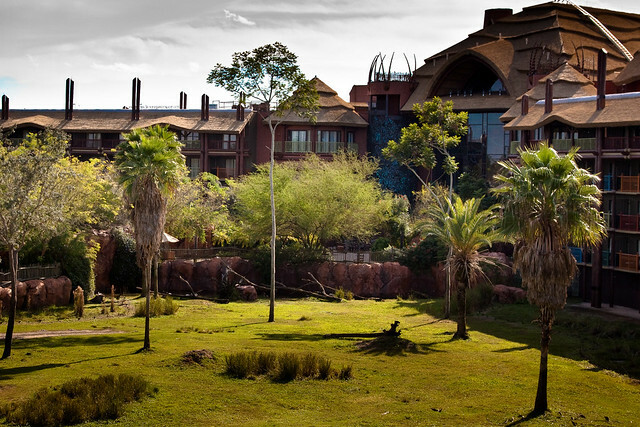 Architect, Peter Dominick’s three-year journey through Africa proved to be very influential in the design of his elaborately themed Disney hotels. Wing Chau, executive vice president of Disney Imagineering reported to Hospitality Design in January 2009 that “Peter’s strong passion for nature and the arts gave him a unique ability to integrate these two elements in his designs” (p. T5). Peter Dominick integrated art and nature to tell a story through architecture. 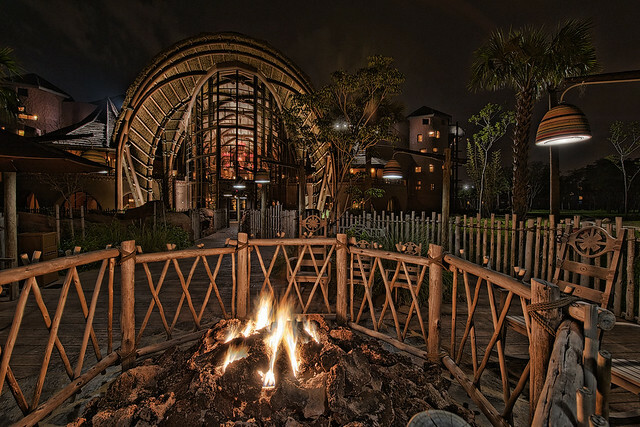 To read into Dominick’s architectural storytelling, I will focus on how Dominick’s mixture of art and nature places visitors in an entirely new environment within 1) Disney’s Animal Kingdom Lodge Resort and 2) Disney’s Wilderness Lodge Resort. In the Animal Kingdom Lodge, Dominick used theming and proportions to make visitors feel as if they are part of a story. The resort is completely themed. The back-story of the resort is that visitors who arrive at the lodge are stopping at an African kraal, or enclosed savanna, built on top of an extinct volcano. Wood pillars in the main lobby were designed to resemble sleek animal horns. Hundreds of pieces of authentic African artwork dating back to 8500 BC are on display, such as the Igbo Ijele mask, which is 16 feet tall and 8 feet in diameter. Rita Demontis wrote in the October 24, 2004 Toronto Sun that, “I found a savage beauty about the place and was quite humbled there” (p.T5). Dominick used size and proportion to make the resort feel realistic. The resort appears small from the front, much like an African lodge. Proportions of the lobby are carefully organized around a double cube with a suspension bridge connecting the two wings of the resort. The horseshoe layout of the guest rooms echoes the shape of a Zulu Kraal. The resort is designed to revolve around animals and nature. Guest rooms overlook the 33-acre savanna, situated in the middle of the horseshoe. Peek-a-boo cutaways with views of the savanna were placed in hallway corners. Outdoor areas, such as bridges, patios, and the main pool invite guests to journey outside and observe nature.